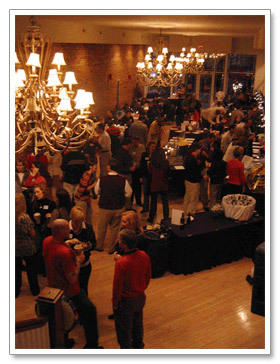 Affordable Rental Space for company parties in Greer, Greenville, and Spartanburg SC. The Davenport is located in historic downtown Greer, SC and is perfectly equipped to host your next company Dinner or Corporate Party. Just minutes from away Greenville and Spartanburg, this newly renovated space offers everything you need to make your event both affordable and special. Hardwood floors, antique chandeliers and the exposed brick wall provide the perfect setting for your next company mixer, corporate gathering, company dinner or coporate party. The historic charm of the flexible space, combined with the new modern features provides everything you need to make your event truly unique - and we at the Davenport will make sure it's a success. The Davenport is flexible enough accomodate a variety of parties for 20 - 200 people. 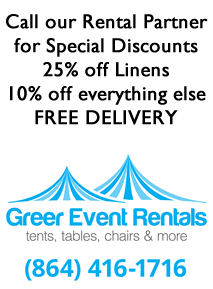 Parking is free and abundant, and all available tables, chairs and linens are all included in the rental fee. For more information about holding your Greenville company party or your Spartanburg coprorate dinner at the Davenport, please contact us and we'll work with you to create to make your event a success. There are many floor layouts for a variety of events. Here are some general guidelines. The maximum for a sit down dinner is 140 people, with room for buffet tables. This is a spacious layout and is limited to 140 primarily by the fire code. The maximum for a standing/mingling reception is 210 people. While we can accommodate a large crowd, groups of 50-70 will not feel over-whelmed by the banquet hall. ©Copyright 2008, Events At The Davenport, All Rights Reserved. Site design by YourMark.com.